Monday, May 2 was my eighth wedding anniversary. My darling husband Bob surprised me with two bouquets of flowers. One was a dozen yellow roses, the other was a lovely mixed arrangement. Today, when I was about to change the water in the mixed bouquet, I noticed something. 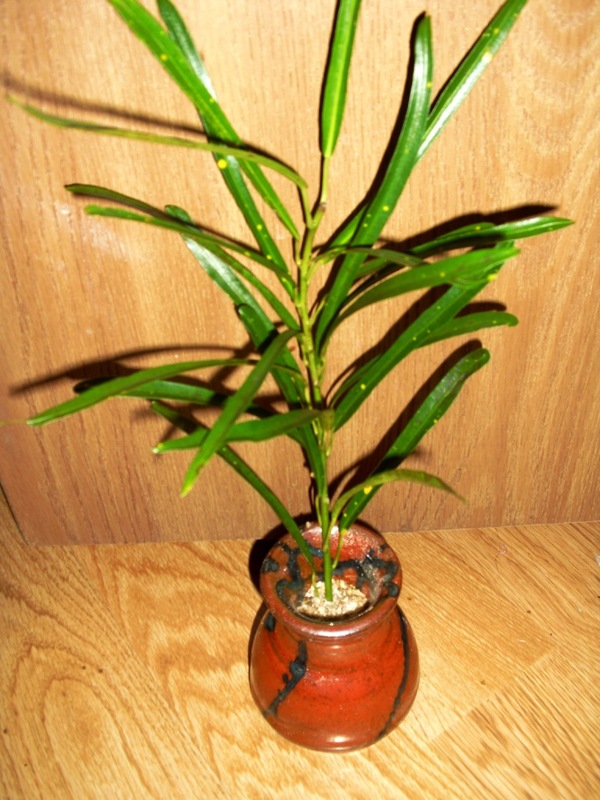 Included as foliage accents in the arrangement were two stems of Codiaeum variegatum, aka, Croton. These were not the one of the broadleaf multicolored cultivars, but rather, a narrow-leaved, yellow-spotted type. One of the stems was looking a trifle worse for wear, but the other was very healthy and vigorous. Mixed bouquet. One of the Codiaeum stems is on the left in this photo. Of course, me being the crazy plant lady, I had to take advantage of this. 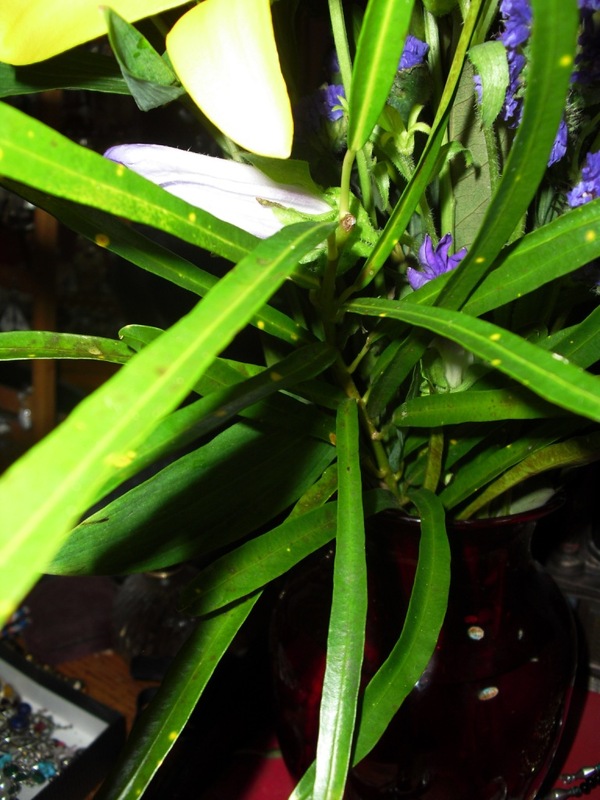 I removed the stem from the bouquet, re-cut the end, and stripped off a few of the bottom leaves. I then dipped the stem in rooting hormone, and placed it in a pot of moist vermiculite to root. Codiaeum stem in vermiculite. The lovely little pot is an early Mother's Day gift from my stepson, Dave. Now we will see. I haven't had much luck in the past with rooting Codiaeum cuttings, nor have I had particularly good luck growing Codiaeum plants (spider mites love them.) But if I succeed, it will be a lovely remembrance of this anniversary. Since I know he will read this: Thanks, Honey, for eight wonderful years! Maybe a plastic tent, just for while it's rooting? Thanks Mr S. Good idea. I'm really out of practice; that didn't even occur to me. What a nice bonus! Your hubby and stepson are so nice with the flower and pot gifts tooo!!! Let us know what happens! Happy anniversary even though it is belated! What lovely floral gifts! That was so sweet and they are beautiful. I hope you had a great day!